An exemplary research and excavation of a Luftwaffe bomber crash site, shot down in 1941, was conducted by the Lancashire Aircraft Investigation Team, resulting in the positive identification of this WW2 aircraft and the unraveling of its story and the crew’s fate. The night of 7/8th April 1941 was a busy one for the Luftwaffe with some 517 aircraft involved in offensive operations against Britain. One of the raiders on that April night was Ju 88 A-5 Werke Nr. 8138, Code B3+IN of II Gruppe, Kampfgeschwader 54, based at Saint-André-de-l’Eure in the Normandy region of northern France. This aircraft was one of seven Ju 88s from II/KG 54 taking part in the raid and it took off on the evening of Monday the 7th April loaded with two SC500 bombs mounted on its external bomb racks, destined for Greenock – the primary target for some 200 raiders that night. The crew for the flight comprised of 30 year old Oblt. Gunter Klemm (pilot), 25 year old Lt. Heinrich Coster (navigator), 26 year old Fw. Alfred Helmut Michael Hofmann (radio operator) and 25 year old Fw. Hermann Ilse (flight mechanic). However despite reaching the target area successfully, the crew found their primary target obscured by dense cloud. Klemm’s crew and some 100 other raiders were ordered to fly on to their secondary targets, most heading for Liverpool and Bristol. At around 23:30 hours Klemm’s Ju 88 was one of around 40 raiders, all individually approaching their designated secondary objective of Liverpool and presumably the crew had begun looking out for their target – the docks area. They were flying in a moonlit, clear sky at approx 10,000 feet, with a cloud layer below at approx 5000 – 6000 feet and found themselves heading towards an anti-aircraft barrage on the outskirts of the city. Unknown to the crew, but probably not unexpected, a number of RAF night fighters – Defiants from No. 256 Squadron, based at RAF Squires Gate near Blackpool – were also on patrol over the city, providing defensive cover in anticipation of an expected attack. At 23:43 hours Flt. Lt. Donald Rock West (pilot) and Sgt. Reginald Thomas Adams (air gunner), both aged 20 with their Boulton Paul Defiant Mk.1 N3445, coded “JT – F” were ordered to take off and patrol at 10,000 feet over the north west coastal area. They were both relatively experienced on Defiants – West having flown his first sortie in August 1940 with No. 141 Squadron and Adams, with 264 Squadron in September. Both had joined No. 256 Squadron in December that year, being paired up as a crew together and with West becoming ‘A’ Flight Commander. At 23:45 the Defiant climbed above the cloud layer, which was by then 10/10ths at 3000 feet and climbed to 10,000 ft, where they began to circle slowly, but saw nothing. With no orders, or information on activity in their vicinity, received by radio from operations, Flt. Lt. West decided to head towards the Anti-Aircraft Barrage which he could see was active over Liverpool. As the shell bursts appeared to be at around 10,000 ft, he increased height to 11,000 ft and then followed a course of 180° for several minutes. Suddenly Sgt. Adams reported an aircraft at ‘9 o’clock below’ silhouetted in the moonlight against the lower cloud layer. West immediately looked in the direction indicated and saw what he described as an “ugly looking silhouette” approximately 100 feet below them and to their port side. With the other aircraft positively identified as a Ju88 by Sgt. Adams, Flt. Lt. West now decided to carry out Fighter Command attack ‘A’ and began by diving below and away from the target aircraft. This put his Defiant some 3000 yards in front and 1000 feet below the enemy raider and from this position West manoeuvred his aircraft by gently pulling the nose up and using right rudder until he was about 150 yards below and 200 yards to the starboard side of the raider. As the Ju 88 overtook the Defiant slightly, apparently unaware of the night fighter’s presence, Flt. Lt. West ordered his gunner to open fire and Sgt. Adams fired a two second burst, accurately targeting the starboard engine, which immediately burst into flames. The crew of the Ju88, clearly now alerted to the presence of the Defiant, returned fire from the upper rear gun position, firing several short bursts, all of which passed well above the Defiant, leading Flt. Lt. West to conclude that the enemy gunner could not depress his gun enough to fire accurately. He then closed to 100 yards from the enemy aircraft and Sgt Adams fired a one and half second burst, again targeting the starboard engine, which became even more engulfed in flames and the Ju 88 began to lose speed and height. At this point Flt. Lt. West maneuvered the Defiant ahead of and slightly below the Ju 88 to give his gunner a better chance of firing into the cockpit and proceeded cross from side to side across the Ju 88’s nose. Again the night fighter came under return fire, this time from the upper front gun position, but again the enemy’s tracer bullets showed that the line of fire was too high and passed harmlessly above them. Sgt. Adams responded with two one and a half second bursts of fire towards the gun positions and into the cockpit, noting the explosive “de Wilde” bullets (almost certainly actually British B Mark VI incendiary bullets – often termed “de Wilde” at the time) bursting inside the glazed nose of the enemy aircraft and the return fire immediately ceased. By this point the Ju-88’s fate was undoubtedly sealed and Flt. Lt. West was forced to break away to port as the crippled enemy aircraft began a shallow dive above him. He then executed a steep 360 degree turn in order the position his Defiant to the enemy aircraft’s port side for another attack, but no such coup de grace was needed, as suddenly the Ju 88 went into a steep dive and entered the cloud layer below. On board the stricken bomber the situation must have been chaos – the aircraft was by now well alight and described by some witnesses on the ground as resembling “a flaming streak” as it dived out of the base of the cloud layer. As the Ju88 descended, one of the 500kg bombs was jettisoned and the crew prepared to bail out. First to leave was Lt Coster, followed by Oblt. Klemm, the pilot, who was badly wounded and then the radio operator, Fw. Hofmann, who for reasons unknown took one of the aircraft’s radio sets with him when he jumped! The flight engineer Fw. Ilse did not manage to leave the aircraft, probably due to having either been too badly wounded or killed during the battle. The falling bomber was by this point heading in a northerly direction towards the town of Lytham, but it gradually turned as it passed over the Ribble estuary and impacted on the edge of the marshes bordering the south side of the river channel near the village of Banks. The Defiant followed its victim down through the cloud layer, emerging just in time for West and Adams to observe a vivid red flash on impact and then witness the blazing wreckage of the Ju88, as they continued back to RAF Squires Gate, landing at 00.12hrs on the 8th April, where it was later noted that they had fired 621 rounds during the engagement. At around midnight, numerous locals who had been alerted by the sound of the combat overhead, now witnessed the Ju88 explode as it struck the marsh, with such force that many assumed the remaining bomb load on the aircraft had detonated. Press reports the following day spoke of “a real pyrotechnic display as the blazing plane became the seat of numerous minor explosions” and how ” various coloured lights burst from the blazing wreckage”. Three civilians from Lytham, on the north side of the river, waded out across the river channel which was at low tide, heading in the direction of the burning wreckage. However, they soon heard shouts for help in heavily accented English and found the wounded pilot, Oblt. Klemm with his right arm badly smashed and carried him back to the embankment at the edge of the marsh where he was handed over to the Police and then taken to Lytham Hospital. On the south side of the river members of the Home Guard, Police and Civil Defence organisations set out onto the marsh towards the wreckage, which continued to burn for several hours and began a search for the crew. Lt Coster, who had landed close to the main river channel and walked along it for some distance, heading back towards the crash site, before he came across two members of the Home Guard and surrendered to them and was taken to Banks police station. The charred remains of Fw. Ilse were found amongst the wreckage of the aircraft, with a burnt and partially opened parachute. Fw. Hofmann’s used parachute and the radio set were found on a sandbank in the estuary the morning after the crash, by the Lytham St Anne’s Lifeboat crew, but he was not properly accounted for until his body washed ashore on the 15th of May and was buried as an unknown airman at Lytham St Anne’s cemetery. In the meantime the remains found at the crash site had been buried at Southport (Duke St.) Cemetery under both men’s names, probably to allay any possible public panic that an enemy airman might be on the loose! 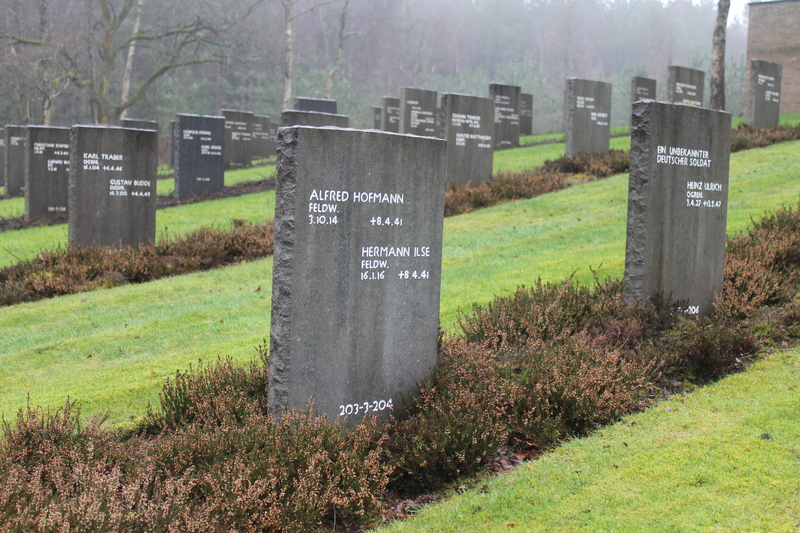 Both casualties now lie at the German Military Cemetery on Cannock Chase Staffordshire, England. After capture, both surviving German airmen were treated for their injuries and initially taken to No.1 Prisoner of War Camp at Grizedale Hall in the Lake District. Oblt. Klemm was transferred to No.13 Prisoner of War Camp at Shap Wells Hotel near Penrith in May 1942 and due to the extent of his injuries he was later repatriated to Germany as part of a prisoner exchange scheme in 1943. Lt. Coster was transferred to Canada to No.30 Prisoner of War Camp at Bowmanville by Lake Ontario. After the war Gunter Klemm flew as a pilot in the reformed German Air Force and retired having reached the rank of Lieutenant Colonel – He never forgot the kindness shown by those who had rescued him and treated him at Lytham, later writing letters of thanks and even inviting the daughter of the doctor who treated him to stay with his family in Germany during a summer holiday. He died in 1972. Heinrich Coster was transferred back to England in May 1946, returning to Germany six months later – He died in 1971.
www.ww2wrecks has reached out to the Lancashire Aircraft Investigation Team and asked Mr. Nick Wotherspoon to shed light on this Aviation Archaeology project, which resulted in yet another significant discovery. How did you initiate this project? This aircraft was one of only a handful of enemy aircraft brought down over the north west of England during WW2 and the only one that, despite being basically left in-situ at its crash site, no group had ever been able to find it. One of our members – Russell Brown – had become fascinated with the story of the crash and the fate of the crew from a relatively young age and had spent a lot of time researching and tracking down witnesses etc. Revealed for the first time since 1941, the crankshaft of a large alloy cased engine. His enthusiasm was infectious and in the 1990s we began to search for the crash site. The area where the bomber crashed is huge and largely devoid of landmarks, with the terrain having changed considerably since the crash. The “lost” second engine successfully recovered. Left to right are LAIT members: Nick Wotherspoon, Antony Eric Watkiss, John Robson and Russell Brown. We continued the search at times when we were not engaged in other projects, and over the years we refined our techniques and acquired more sophisticated equipment, leading to the location, in 2015, of one of the aircraft’s engines and subsequently a full professional geophysical survey of the site, which proved that just as we anticipated, most of the wreck still lay buried. Then began the long and detailed process of getting all the required permissions in place before we could excavate. How satisfied are you with the successful completion of this Aviation Archaeology project? We knew the aircraft had been severely damaged as a result of the severe impact and post crash fire – period photos of the aftermath showed that the cockpit area had clearly been totally destroyed. Also post-crash Air intelligence investigation and local looting of the crash site meant we only really expected to recover major components. The experts initially believed that the second engine was located right at this spot. In fact, it proved to be two heavy steel centre section beams and a small amount of associated wreckage from the wing mounting area of the fuselage. Overall we recovered both engines, both propeller hubs, both main undercarriage legs, one complete main wheel and parts from the second, remains of the tail section, dive brake and wing structure remains, two external bomb racks, all four steel fuselage centre section strengthening beams and sections from the bomb bay and dinghy stowage – with numerous smaller finds as a bonus. But finds aside, this project gave us a great opportunity to work with other agencies and to properly record our excavation and tell the stories of the airmen involved. What is the key lesson learned from this project? The excavation was carried out in very difficult terrain, on marshland 1 km out from the coastal embankment and much of the wreckage that had lain on the surface after the crash, was now covered by between 1.8 and 5.4 meters of mud and sediment. 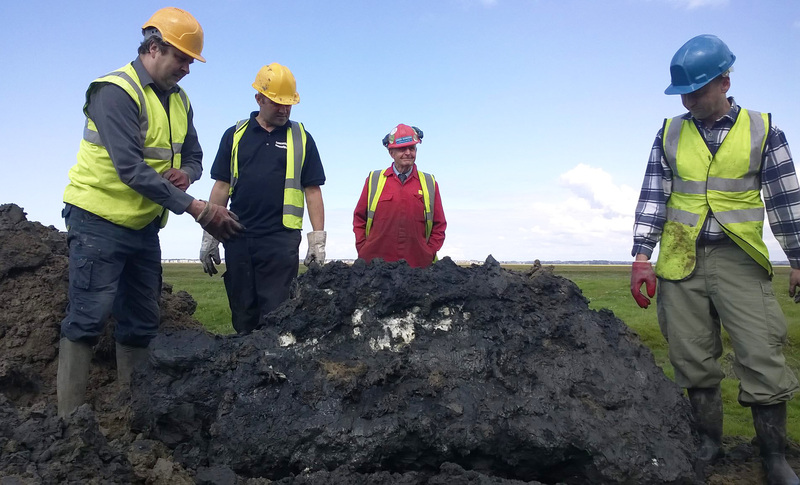 We already had considerable experience of the expected conditions following our 2005 dig on nearby Warton marshes with the Time Team on two A-26 Invaders. For this excavation we developed a new technique, where excavation had to be precise and quick as the ground only remained stable for a short time and shoring was impractical. So larger objects were pinpointed using magnetometers, marked out and the excavator driver briefed how best to proceed. The only drawback to this method was that smaller artifacts lying away from larger targets may have been missed, but as opening large scale excavations was simply not possible due to the ground conditions and sensitive nature of the site, this was deemed unavoidable. What will the artifacts recovered become? Under the UK permit system, all finds are assessed by the Ministry of Defence and if not required for a national collection, ownership is passed to the licence holder – in this case one of our members. Caricature in pencil, captioned “Leibnitz” found on part of dinghy stowage structure – presumably poking fun at someone in authority on the production line? All artifacts are presently undergoing cleaning and conservation to get them ready for public display – one local authority run museum has already expressed an interest in putting on a display of representative finds and other local venues are also being considered for temporary displays, so that people local to the crash site will get an opportunity to view the finds. ETC500 external bomb rack after initial cleaning – item in background is a flame damper unit from one of the engines. But the likely permanent home for the remains will be our newly refurbished exhibition room, located at the “Hangar 42” museum / visitor’s centre at Squires Gate, Blackpool – in an original wartime hangar that once housed the Defiant night fighters of No. 256 Squadron that shot the Ju 88 down! The ATG manufacturers plate – Allgemeine Transportanlagen GmbH (ATG) at Leipzig – a company that manufactured the tail sections and fuselages for the Ju88, as well as carrying out final assembly of the aircraft – Note: it bears the inscription “88” for the aircraft type, “A1 ” for the aircraft sub-type ( Many Ju 88 A5s were initially being constructed as A1s on the production line but were upgraded to the later A5 specification before completion) and “8138” – The Werke No. that identifies this individual aircraft.